Meet Richard. He’s in fifth grade, loves his teacher, enjoys running, swimming and drawing, and has an ear-to-ear smile that makes him friends wherever he goes. And he’s gone a lot of places lately—while he lives in Los Angeles right now, his real home is in Beijing. But there’s something especially important about Richard that his mom wants you to know: He has courage. A lot of courage. And since Jan. 19, 2017, he has needed every ounce of it. 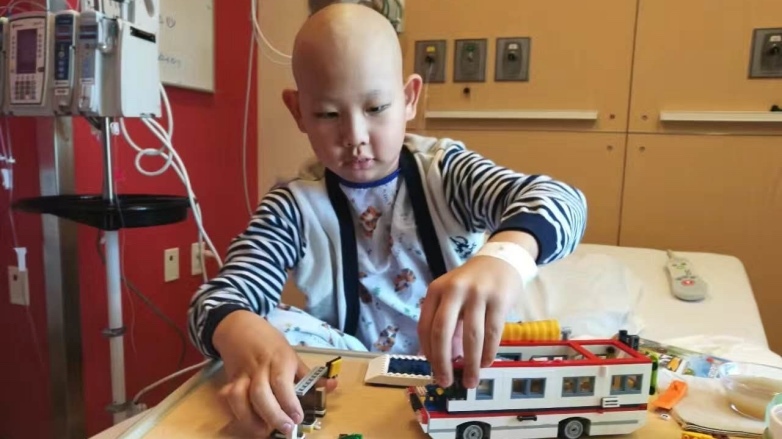 That’s the day when—back in Beijing—Richard was diagnosed with neuroblastoma, a cancer that arises from immature nerve cells. He had a large mass in his abdomen, and the cancer had spread to his bones and bone marrow. As you might imagine, this was devastating news for Richard’s mom and dad, Yun and Suguo. Even worse, doctors there offered little hope for Richard’s survival. Indeed, the latest neuroblastoma therapies aren’t available in China, or anywhere else in Asia. Like their son, Yun and Suguo have courage. 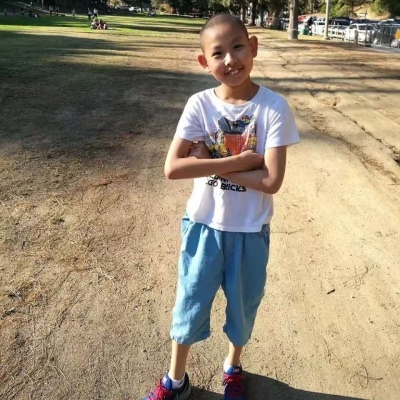 Refusing to give up, they found a doctor in China who had trained at Children’s Hospital Los Angeles, one of the leading centers for neuroblastoma treatment. 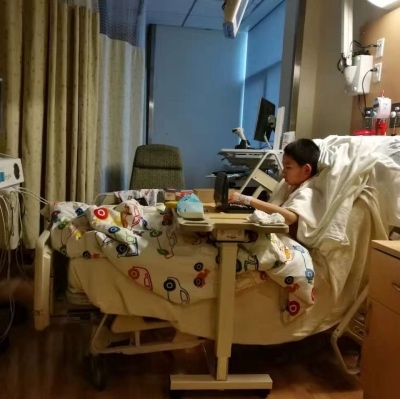 That physician urged the family to take Richard (his Chinese name is Xiaorui) to CHLA for treatment, and he contacted the hospital’s Center for Global Health. The Center helps international patients by serving as a vital liaison between families, embassies and the hospital’s medical team. Since the program’s creation in 2013, more than 850 patients from 70 different countries have come to CHLA for treatment. When the Center got the call about Richard on Jan. 25, 2017, the team sprang into action. International Case Coordinator Mona Lisa Navarro immediately began communicating with the physician in China and then directly with Richard’s family, who responded with Richard’s medical information the same day. From there, Navarro sent the case to Araz Marachelian, MD, MS, director of the Neuroblastoma Program in the Children’s Center for Cancer and Blood Diseases at CHLA. Just one day later, Richard had an appointment booked with Dr. Marachelian and her staff for Feb. 8, allowing the family time to secure visas and travel to Los Angeles. Navarro also helped to arrange for temporary housing near the hospital. 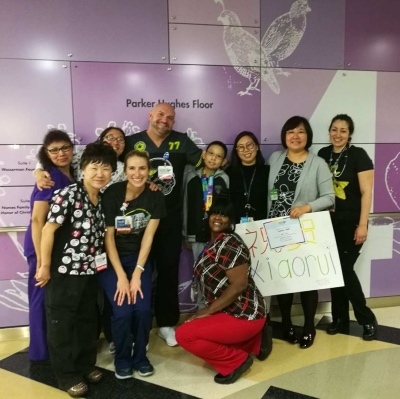 On Feb. 7, 2017, Richard and his parents landed at LAX and soon were meeting with Dr. Marachelian and the CHLA medical team, along with the Center’s staff and a language interpreter. Dr. Marachelian drew a diagram on a whiteboard, outlining every phase of the comprehensive treatment plan. Richard’s journey was just beginning. It would be a difficult one. When he first arrived at CHLA, he was in terrible pain, both from his stomach and his bones. He could barely walk or even sit up in bed. His mother would stand at his bedside, feeding him spoon by spoon, coaxing and imploring him to eat. Because the tumor in his belly was so large, doctors needed to shrink it before attempting to remove it. That meant several months of chemotherapy, and all the standard side effects from it. After three months, Richard was starting to feel better, but Dr. Marachelian didn’t like his numbers. That was discouraging news, but Dr. Marachelian was ready with a Plan B. She enrolled Richard in a clinical trial at CHLA that was studying a combination of chemotherapy and an immunotherapy drug called dinutuximab. Dinutuximab is a newer therapy for high-risk neuroblastoma and is typically used toward the end of treatment. (It’s one of the medications unavailable in China.) CHLA was involved in all the early trials that led to the drug’s approval, but this newest trial allowed Richard to receive the drug much earlier in treatment—and in combination with chemotherapy. The therapy is intense, and Richard had to be hospitalized to receive it. But after just six weeks, there was good news—actually, amazing news: The cancer in his bones and bone marrow was gone. Treatment for high-risk neuroblastoma is long and arduous, and Richard still had more hurdles to overcome. One by one, he cleared them. After the clinical trial, he needed radiation therapy to further shrink his main tumor. CHLA surgeon James Stein, MD, an expert in neuroblastoma tumor removal, spent 10 hours with his team in the operating room, meticulously extricating the main tumor—which was wrapped around his right kidney and numerous blood vessels. Because of those efforts, Richard’s kidney was saved. As soon as Richard had recovered from surgery, he had to have back-to-back autologous stem cell transplants—spending a month in the hospital each time. Finally, he underwent six more weeks of dinutuximab treatment. In all, he was hospitalized for 200 days during his year and a half of treatment. The other team that has been by Richard’s side this whole time is the Center for Global Health. The Center works closely with each family throughout their stay at CHLA—giving them a primary point of contact and coordinating everything from admissions, meetings with the medical team, translation services, assistance in securing housing and a bank account, and more. But the work goes beyond logistics and details. Over time, Center staff form close bonds with patients and families. “We try to be that support system for them, that family away from family,” Petrosyan says. By now, they know Richard and his family really well. They, too, have seen Richard’s courage—and happy, fun-loving spirit—firsthand. Today, Richard is 11 ½ and in remission. He has lots of energy and has learned English in a snap. Because he needs to be monitored frequently, the family is still in Los Angeles. 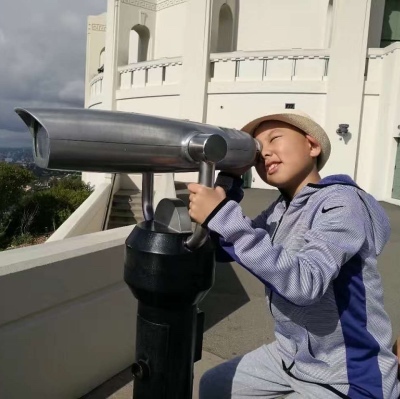 When they recently visited the hilltop Griffith Observatory, Richard hiked the whole trail up, and all the way back down. In August, Yun and Suguo wrote letters to CHLA, thanking Dr. Marachelian and hematology-oncology fellow Xiaofan Shen, MD (who speaks fluent Mandarin and is very involved in Richard’s care), Dr. Stein, the many other doctors and nurses who have cared for their son, and the Center for Global Health staff. If you are an international patient interested in coming to Children’s Hospital Los Angeles for care, please contact our Center for Global Health at +1-323-361-8737 or email internationalpatientreferrals@chla.usc.edu.